Here’s a puzzler: Why is the president of the United States announcing the opening of new factories that a major U.S. company has not announced? U.S. Steel is a publicly traded company, so it is supposed to disclose materially important information. The opening of six major facilities and the expansion of even more would be huge news. Yet all U.S. Steel has announced is that it will restart two blast furnaces and steelmaking facilities at the company’s Granite City Works integrated plant in Illinois — one in March and the other in October. The reopening of the first blast furnace was announced in March, resulting in 500 jobs, and the second was announced in June, adding 300. The plant had been closed since 2015. President Trump has a tendency to cite conversations that did not occur quite the way he describes them — if they took place at all. So we were a bit suspicious when he mentioned a phone conversation with Dave Burritt, chief executive of U.S. Steel. Burritt did take part in a roundtable in March at the White House, and in May the president appeared to reference that meeting. But then, on June 20, the conversation became a phone call. On June 26, Trump suggested the news was disclosed in a public announcement. One would think this would be easy to clear up. But the White House did not respond to a query. Burritt also did not respond to an email from The Fact Checker asking him to confirm the conversation. Translation: The president is wrong. But apparently U.S. Steel is afraid to say that out loud. Cox ignored our question about whether Burritt had had a phone conversation with Trump — and she ignored our follow-up query restating that question. So one can only assume the phone call did not happen. Wall Street analysts who follow the company are also scratching their heads. They knew of no such expansion. But Charles Bradford of Bradford Research in New York suggested a possible explanation. He noted that an integrated plant such as one in Granite City is made of five or six parts. There’s a blast furnace, but there is also the production of pig iron, an intermediate product; the continuous caster, which creates large slabs; and the rolling mill, which flattens those slabs to a customer’s specifications. Bradford added that U.S. Steel has been in discussions with a Japanese company to form a joint venture to produce high-strength steel, a new product. So that also might have been part of the discussion at the White House meeting. That is, if such a conversation actually took place. Bradford said the bigger problem is that the Granite City facility should have been closed 20 years ago. He said it is not competitive with the highly efficient steel mini-mills that have sprung up in the United States, making large integrated mills too costly to run — at least before Trump imposed tariffs. This should be easy to clear up: Either the president of U.S. Steel tipped market-moving information to the president of the United States, or he did not. Interestingly, the securities markets have not reacted at all to the president’s disclosure; U.S. Steel’s stock fell the day after Trump made his comments about six new facilities, and it has continued to decline. Perhaps that means the stock market puts a low premium on the president’s statements. 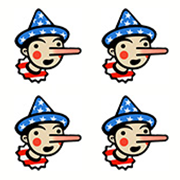 Here at The Fact Checker, we award Four Pinocchios. during a roundtable with American workers, Duluth, Minn.